The artist Alex Katz is mostly new to me. 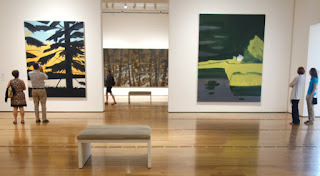 When the High Museum of Art announced the summer exhibition "Alex Katz, This Is Now" would arrive in Atlanta this summer, my shoulders shrugged while asking, "Who?" But during an afternoon with 60 works by the American painter, sculptor and printmaker, I can tell already tell that, though a new addition, Katz will remain on my "favorite artists" list for many years. What a great surprise! 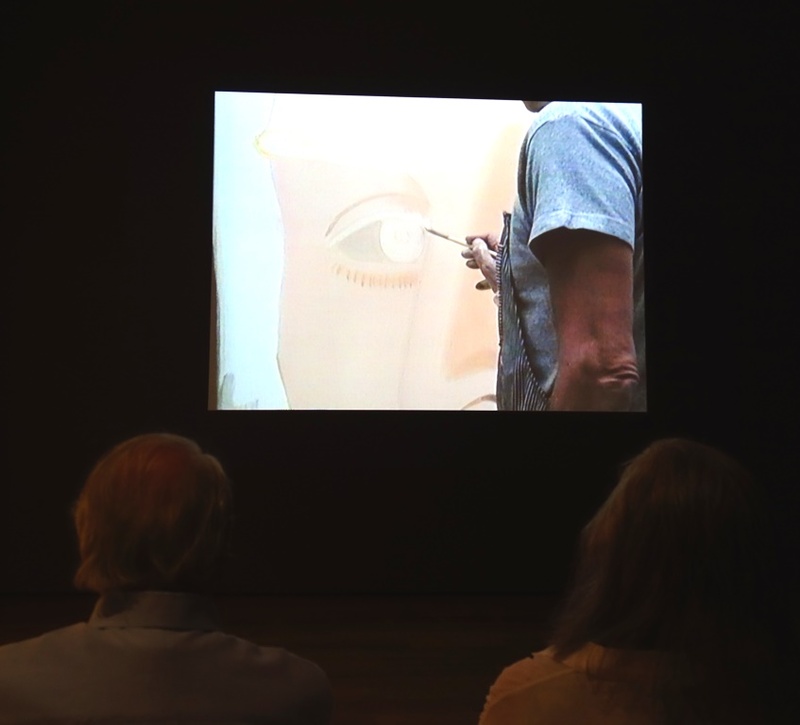 Certainly my eyes previously spotted his works, starting with a view of "Wrecks 2" in the High's permanent collection, another dog feature at the Milwaukee Art Museum, and during visits to the Chicago Art Institute, MoMA and Tate. I also noted Katz painting cameos on the silver screen (example: Ben Affleck's law firm office in "Switching Lanes" tees up a "beach girl" monologue). But the artist's name didn't stick. The tipping point arrived while standing beside several enormous canvases -- with billboard measurements in some cases -- mounted at the High. In a word, fantastic. Size and scale are part of why I didn't previously "get it" with regards to Katz. 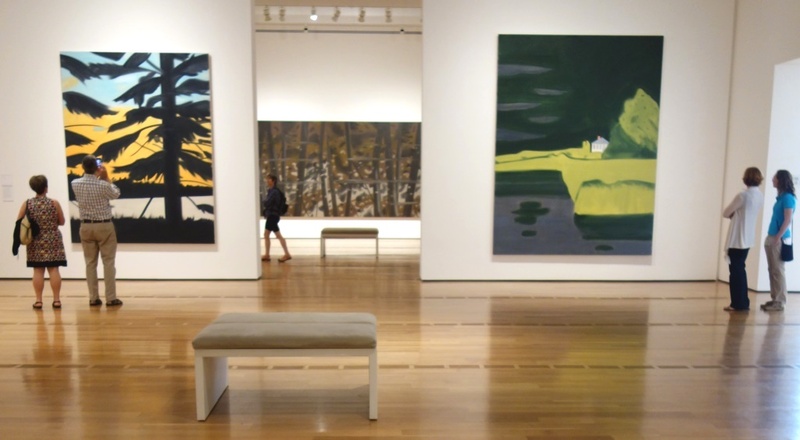 Looking at his monumental works on a small screen or in a book does not do the art justice. The current exhibition focus is on landscapes painted by Katz, with a handful of portraits or small studies for larger works also on view. While I enjoyed many of the outdoor scenes -- forests silhouetted by sunsets, wide views of lakeside residences, seashore landscapes and a few florals -- the exhibition left me craving more Katz close-ups of people engaged in thought, everyday activity or gazing at museum guests. 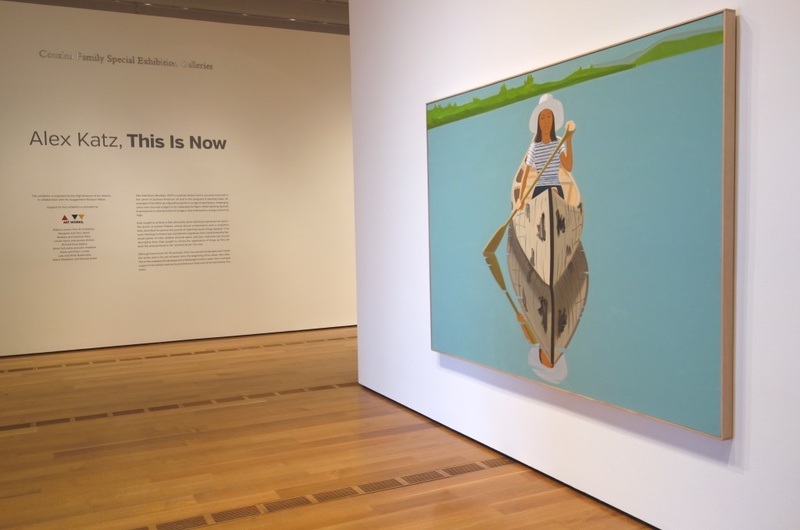 The exhibition begins with the 72" x 96" oil on linen "Good Afternoon" featuring a woman paddling a canoe toward the viewer. "Welcome to the exhibition" wall text is flanked by several small watercolored paper items, and a summer picnic scene eases visitors into the larger galleries. I was most impressed with two canvases -- "January 3" and "January 4" -- featuring Katz's wife dressed for a 78" x 155" winter walk in the park. Around the corner from their wall space, the High presents an abbreviated version of the documentary film "Five Hours" in a side gallery of the exhibition. When recorded in 1996, the film captured Katz's in-studio craft and the creation of "January" for posterity. See if you agree the film's laughter-infused soundtrack comes across as the artist's inner monologue while at work (more than one fellow-patron chuckled with my assessment Katz may be laughing his way to the bank). The large floral canvases featuring white and red roses are beautiful but, for this writer, not as moving as, say, Georgia O'Keeffe blossoms. 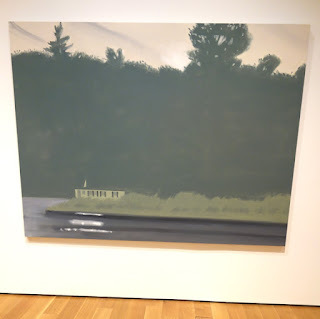 Something about their flatness does not resonate for me the way Katz's "Blue Umbrella 2" brought an immediate, nicely intimate viewer:subject connection (to the extent that a 96" x 144" canvas may be considered 'intimate.'). The works in the later galleries sort of left me hanging. But the exhibition inspired a hunger for more information about Katz and post-visit study of the exhibition catalog. This research also yielded a Katz wish list of works I will seek out in the future. 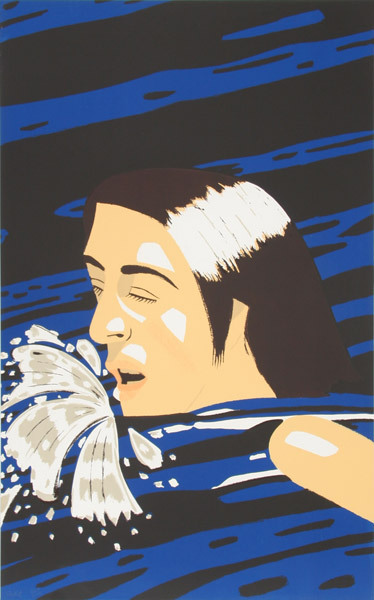 One such work is a Games-inspired 1976 serigraph titled "Olympic Swimmer" which appears to be available via several auctions and galleries. You, too, could own 1 of 200 copies for $2,000 to $4,500. And while waiting for a few reserved library books to arrive for more reading, I'll ponder the notion that "Katz spotting" will be a favorite pastime at future museum visits. According to the High website, "Katz described his goal as the pursuit of capturing 'quick things passing' in his work. 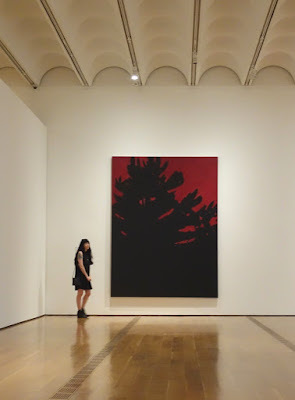 Katz's monumental landscape paintings are executed in what is now considered a signature style characterized by flattened planes of color, shallow pictorial space, and lean, reductive but acutely descriptive lines. In them, Katz seeks to convey the appearance of things as they are both felt and perceived in the 'present tense,' the now." Fleeting moments of daily life for people captivated me. Fleeting moments of sunset in the woods, though gorgeous, didn't arrest my attention the same way. No matter. 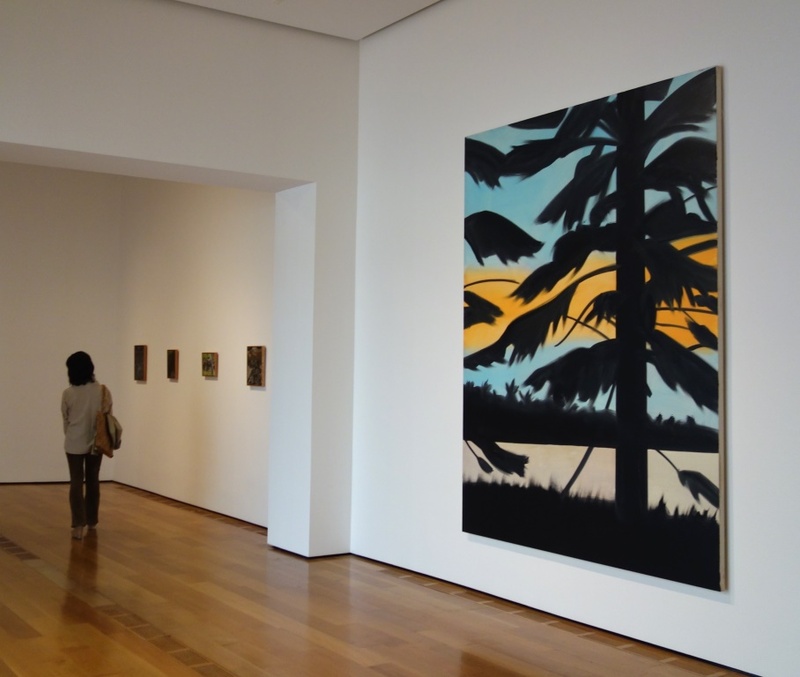 For landscape, portrait or "other" art lovers in Atlanta, now is the time to get to know Katz. Photos by Nicholas Wolaver; "Olympic Swimmer" via this link.